Salutations once again from edX headquarters! 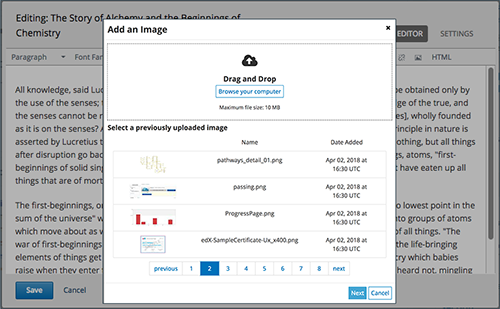 We’re excited to tell you about the work we’ve been doing to improve the Open edX platform for both learners and course authors. We’re preparing for the European Union General Data Protection Regulation (GDPR) that comes into effect this month, including clarifying data policies and supporting account deletion. Work will soon be done on our new Add or Edit Image dialog box for HTML components. With this new feature, you won’t have to open your Files & Uploads page to add an image in an HTML component. Instead, all of the images you’ve already added to the Files & Uploads page will be available for you to select right inside your HTML component. In addition, you can drag image files into the Add an Image dialog box if you haven’t already uploaded them! We’ve just updated HTML components to give you even more easy formatting options! Four new buttons in the toolbar allow you to align your text the way you want: aligned to the left or right, centered, or fully justified. For more information, see The Visual Editor in Building and Running an Open edX Course. 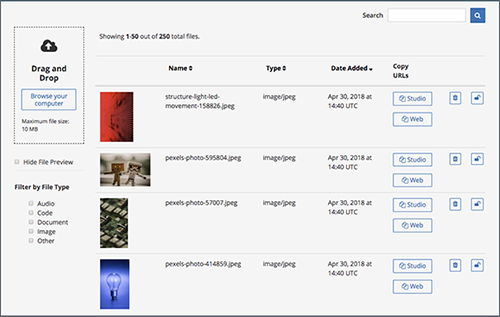 We hope you’ve had a chance to use the improved Files & Uploads page! We went all the way back to the drawing board (literally!) to re-design this page, addressing some of the most common pain points course authors faced. With the Drag and Drop field, you can just drop files onto the Files & Uploads page instead of first opening a dialog box and then navigating through your folders to locate your files. Additionally, you can upload multiple files at once! To copy a Studio and web URL for a file, you now click a single button. Additionally, we updated our documentation to more clearly explain when to use Studio and web URLs. Looking for a particular file? You have several options. Use the arrows next to the Name, Type, and Date Added column names to sort all of your files by that column. Select a Filter by File Type option to show only audio, image, document, code, or other files. Enter search criteria into the Search field to find files based on any part of the file name or type. If your course uses a lot of tall image files, you can use the Hide File Preview option to avoid having to scroll down a long Files & Uploads page. For more information, see Adding Files to a Course in Building and Running an Open edX Course.